Susanne Vielmetter Los Angeles Projects is pleased to announce Manufactured Paintings, Monique van Genderens third solo exhibition with the gallery. The artists unique vocabulary and research in abstraction will include three totemic works in Gallery 1 and a group of smaller scaled works in Gallery 2. Inspired by Morris Louis model of working in his dining room, evidently not knowing the final composition until the canvas was stretched for exhibition, van Genderens project is a twofold experiment. By pushing the physical boundaries of her studio in order to intervene on collectively accepted notions of scale, the artist set to work from disorienting vantage points. Due to decisions out-scaling the studio, her materials rested simultaneously on the floor and walls as she worked, forcing a certain relinquishing of control and allowing an alchemy between pigment and substrate to form and shape her compositions. The result is a maximized viewing environment in a restrained number of works for the larger front gallery. Monique van Genderen received her MFA from the California Institute of the Arts, Valencia, CA. 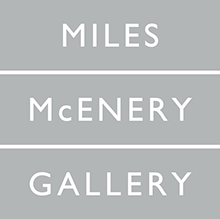 She has had solo exhibitions at the UCLA Hammer Museum, Los Angeles, CA; Kunstverein Heilbronn, Heilbronn, Germany; Wexner Center for the Arts, Columbus, OH; Pennsylvania Academy of the Fine Arts, Philadelphia, PA; Chinati Foundation, Marfa, TX; Ameringer | McEnery | Yohe, New York, NY; DAmelio Gallery, New York, NY; and Michael Janssen Gallery, Berlin. 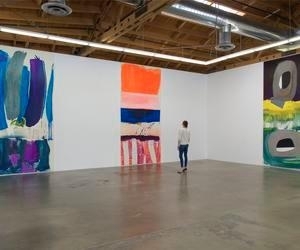 Her work has also been included in group exhibitions with the Los Angeles Nomadic Division (LAND), Los Angeles, CA; Kunstmuseum St. Gallen, Switzerland; Japanese American National Museum, Los Angeles, CA; New Museum, New York, NY; and in the 48th Corcoran Biennial in Washington, D.C.
Susanne Vielmetter Los Angeles Projects is located at 6006 Washington Blvd in Culver City, 1 block west of La Cienega at Sentney Avenue. Gallery Hours are Tuesday through Saturday from 10 am - 6 pm and by appointment.